It’s a long shot. In September, when I applied to enter the 2019 Race to Alaska, May seemed far enough away for preparations, and I was – and remain – delighted to have been accepted. The biggest complication to making this happen is that the Race to Alaska (or r2ak) is on the west coast, and I am 3500 land miles away in Maine, with a certain number of complexities to the prospect of getting across the country. When this past December rolled around, with some clarification of who was interested in being part of this crazy trek, and who was (very sensibly) not, I one day decided that, realistically, 2020 would be my year, and not the upcoming 2019. But the universe apparently has other ideas. The evening of that very day, after my grand decision to wait for 2020, I happened to check the statistics page for this blog, which I had not done in quite a while. That page shows how people have come to look at the blog, with links to other pages that have referenced Sailing AUKLET; one of those links was to a not to be named sailing website. Now, I ordinarily, these days, refuse to look at that particular site, having to do with massive sexism and very obnoxious email exchanges between the person who runs it and women who have written to encourage a more inclusive approach, including me. But there it was, that link. 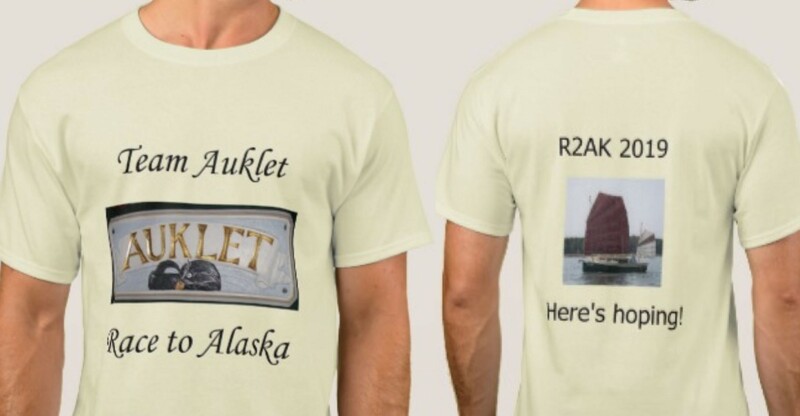 When I followed it back to the AUKLET reference, I happened to read the somewhat secret information, apparently disclosed only at the previous fall bash for r2ak racers, that 2019 would be the last year that the Race would be put on in the way that it has been for the last four years. At least that’s how I heard it. This statement, in the version confirmed a couple of days ago by Kate Philbrick, one of the race contacts at the Northwest Maritime Center, is that “There will be an announcement this fall about a change in the race for 2020.” It’s more ambiguous than how I took it at first mention, but you never know. Now, I have been preparing for the Race to Alaska, in its current form, for at least five years, since it was first proposed and its rules were made public. AUKLET has been outfitted, and I have been developing my sailing skills, all with that race as a guiding theme. The idea of actually doing it has always been far-fetched, given some of the assorted obstacles, but nevertheless, as we now say, I have persisted. Quietly, the various requirements have been ticked off the list: night sailing; heavy weather capabilities (the junk rig has been part of this); building, testing, and becoming comfortable with the yuloh, as no motor is allowed to be on the boat for the race, but you still need a way to move around when the wind dies. Furthermore, on the yuloh subject, human power is required to get in and out of Victoria Harbor, because raised sails are not allowed past a certain point by the Port of Victoria harbor authorities. This restriction means that one must do something else for the last mile from the harbor entrance to the dock in the inner harbor, where the bell that marks the finish of the qualifying leg of the race is located. My entire effort toward becoming a motorless sailor, though interesting to me anyway, has been particularly inspired by the motorless aspect of the r2ak. The list of race-inspired undertakings goes on and on: water collection; the boat farm; the trip in 2013 with enough stores for five months, and no shore support at all for six weeks (because if you are going to make the roughly three-week trip to Ketchikan, you might as well sail further into Alaska after the race is over). The Race has been a fantastic guide. So I have not been excited about the prospect of postponing to 2020, with some kind of unknown changes to how it might be run. Another issue that had been bothering me was the last stretch of the main leg of the race. Ordinarily, after you cross an international border by sea, you are not allowed to “touch land” – whether the shore itself, or the bottom underneath the water (say, with your anchor) – before presenting yourself to the border authorities at an official check-in location. Ketchikan is the nearest one of those locations, after crossing the BC/Alaska border, but it’s a solid (so to speak) 40 miles from the closest anchorage on the Canada side, to get to that port of entry. That’s a bit of a long coastal run, especially solo, in the best of conditions. And crossing Dixon Entrance – the open water that helps define the British Columbia/Alaska boundary – is known for horrendous weather and seas. It can be hard sailing, both strenuous, and long. After the open water crossing there are 30 miles of narrower channels (read: no naps), which depending on the wind might be easy, or also long and tiring, before one actually gets to Ketchikan. With poor wind, the sailing time could be measured in days, rather than hours. Very good-looking anchorages exist on the Alaska side, in that extended stretch before Ketchikan, but then there’s that border rule. In a second bit of excellent news, the race organizers have worked something out with the US authorities, so that boats participating in the Race to Alaska are allowed to anchor on the American side before they check in at Ketchikan. Not too long after the T-shirt fun, I discovered that my imaginary gigantic staircase was not quite such an issue, as well as the piece about anchoring being allowed on the north side of Dixon Entrance. The possibility of actually doing the 2019 race became quite a bit more real, though getting across the country remains the largest complication. On this too, there have been developments. Enthusiasm and offers of help have been coming from numerous directions, all contributing to the possibility of this crazy idea actually going forward. My dear friend Kate will be on summer break from her work in the school system when it’s time to come home, and likes the idea of driving back from Washington state together. “Driving together” is a euphemism – I actually don’t drive at all nowadays, and these driving friends are gamely signing on for all of the time behind the wheel, 3500 miles one way notwithstanding. Getting AUKLET across the country is yet to be sorted out, but I would not have even thought this overall idea was possible without another friend, Luke, who initially suggested that it would be perfectly easy for him to haul the boat with a truck, and he would be happy to do it. Scheduling constraints are not working out for him after all, but when he said it in early September it really opened the door to the overall possibility, and his original offer seriously contributed to my putting in the race application in the first place. There are definitely other ways to get AUKLET across the country, with many boat transport companies out there; alternatively, if anybody knows a reliable person with a full-size truck capable of trailing 6000 pounds over the Rocky Mountains (expenses/fee paid), and time for doing that in early May, there is also that opportunity to be part of this crazy effort. Further inspiration has been provided by Tim, who comes to Maine during the summer, and has been particularly enthusiastic about this race proposition. He and his wife Jane travel by RV, and he was already familiar with the RV campground that sits right on Point Hudson, overlooking the Port Townsend start of the r2ak. Not long after we talked about it all, he wrote to say that he had reserved a site for most of the week before and up to the start of the race. That certainly made it real! Here at home, boatyard projects have been proceeding with the possibility of all of this in mind. Suzanne has generously been out in the shed with me, drilling new holes in the boat for proper eye straps for the solar panel tiedowns, which up until now have been less than ideal, and Chubba came over to help with the installation. Other projects are ongoing, some of them now waiting for the winter cold to break. The whole prospect is still far-fetched, but if the pieces keep dropping into place it could happen. I’m approaching it with openness to cosmic guidance, and thoroughly enjoying the ride. Shemaya, this is awesome! Come see me in SB! Very best of luck getting all the pieces to fit. Carol! You’ve been on my mind – a proper email coming soon. Wouldn’t that be wonderful, to get to come south down the coast and see you! This is great – you are an inspiration to sailors, adventurers and all. Chebacco sailors will be watching your personal and your team’s journey and progress in the r2ak this year. Chebacco.com is behind you even if it is only virtual support. Thanks so much for the support, Andrew. Sure hope it works out, so we get to see both a Chebacco and a junk rig in the race. Wouldn’t that be a thrill! Welcome to the “Wet” Coast. The race will pass us in Courtenay, 2/3 of the way up from Victoria to WP1, just south of 50deg N. (50N being the top end of the Georgia Strait) Won’t have a boat on the water yet… maybe on the shore to watch the distant sails go by. Enjoy the wonderful views you will have all the way up. Thanks so much for the welcome, Len. Oh yes indeed, about the wonderful views. Looks like a really good anchorage right near you, in back of Goose Spit. Depending how things go – you never know – we could be getting some rest and enjoying a snug spot from whatever weather, right around the corner from you. I’ll bet that’s a beautiful place for watching the boats go by, on a good day for it. 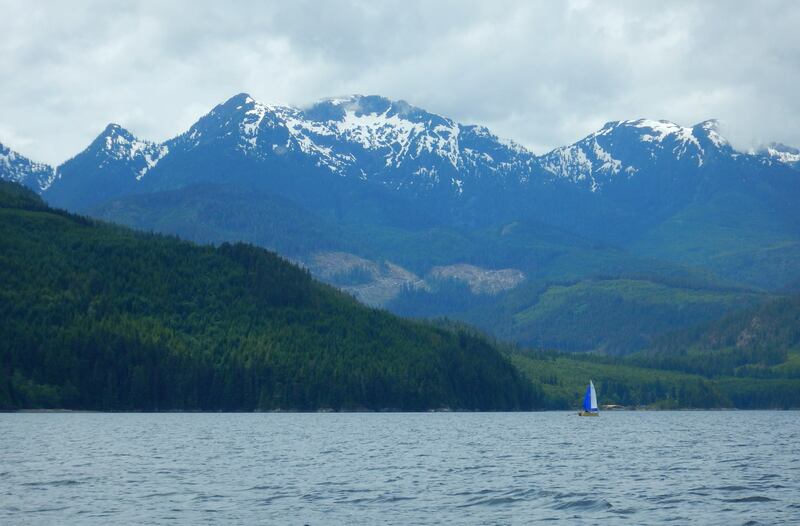 If you are going to anchor behind goose spit, I would suggest traveling up between Vancouver Island and Denman Island. The sand bar from the sandy Island marine park extends a long way north and looks quite crossable but may be less than 3 feet deep a long way North. Going out to the North after is no problem. Of course the wind may make going a little farther North and straight across faster. We had power when we have gone out. Good to know – I’ll keep that in mind. One nice thing about AUKLET is that the boat has just a 2 foot draft… not that it isn’t possible to put it on a sand bar regardless! It’s interesting, Google Earth shows a really nice inner pool in back of Goose Spit, with what looks like boats anchored in there. And then both electronic and paper charts show it drying. Was it dredged? Or maybe something else happened? Looks like quite a nice spot. I sent a reply through the JRA site as it was getting a bit long here. Go Shemaya!! So good to read that you continue on toward fulfilling your dream! If anyone can, YOU will make it happen. With your persistence, dedication to thorough preparation, skill, courage, and indomitable spirit of adventure, you are an inspiration to me personally and I know to every member of JRA. I write these things with especial earnestness, remembering where you were at in your “journey of sailor self” just over a year ago. I regret not owning a vehicle capable of towing 6,000 # and also not being able to get away but, alas, both are the case. The best I can do is add to my wardrobe and on as many occasions as possible—the 2019 Junket goes without saying— proudly proclaim that I am a follower of Team Auklet. Bless you and take care, Shemaya!! Shemaya is off to another grand adventure. Your planning and logistical approach will make most contingencies easy obstacles. Your courage and determination will take care of the rest, even the surprises. You have already got a bunch of us cheering this adventure along, and we’ll have a great time following the progress. We’ll help prepare on this end so Auklet gets a good start. Fun, fun!!!! Chubba, I like the idea of “easy obstacles.” Thanks so much for all the good thoughts – we’ll have some fun indeed! Oh the places you will go, the people that you will meet! Hi Terry! The *women* ;-) on the team are delighted to have your support! This is Kristin from TeamKELP. I was reading your bio and learning about your story, so amazed and in awe, only to find reference to us at the end. Wow! I can’t even believe it – what an amazing surprise. If you want any advice or have any questions, please reach out – you should be able to send us a facebook message! You’ve got this and are going to rock it! I also really appreciated the thoroughness of your team Facebook posts – going through all the photos and chart images that you posted has really helped with getting a grip on the route. Besides that I love the idea of Narnia. So much beauty and peace, when you find the perfect harbor. Oh gosh, I’m just going to sound like a groupie :-) Anyway, thank you again for writing. I look forward to the possibility of being in touch. HI Shemaya – Thanks for your reply! if you get my email through the comment, please email me directly! I would love to be in touch further, and can’t wait to follow your adventure.